There are a couple of techniques for straightening crooked images in Acorn. Open your image in Acorn, File ▸ Open. Increase the size of the canvas window by dragging outwards on a corner of the canvas. 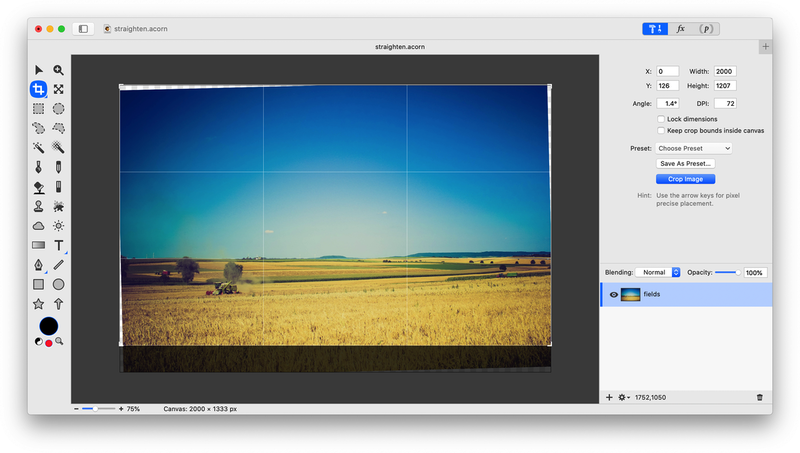 Select the crop tool and click and drag on your image to create a rough crop. You can change the crop dimensions later. Then, click and drag within the gray space of the window to rotate your image until it matches up with a horizontal or vertical reference of the crop tool. You can move your crop around to assist with lining things up. 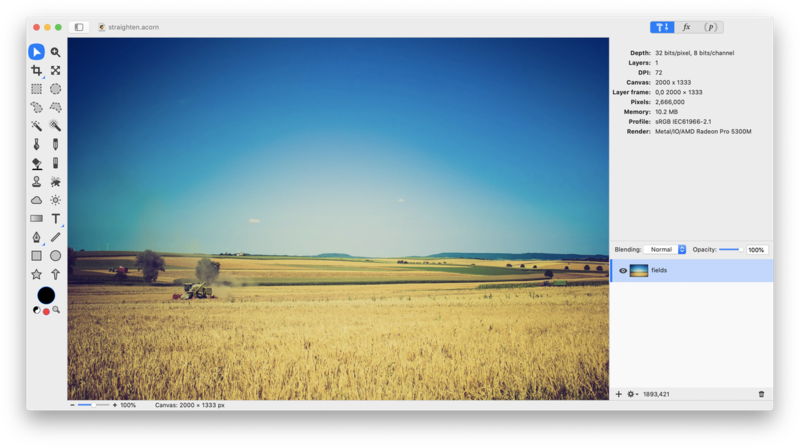 Increase or decrease the size of your crop by dragging on the crop corners to eliminate any transparent areas in the image that were created. Click ‘Crop Image’ when you are ready! Open your image in Acorn. Turn on your grid, View ▸ Show Grid or keyboard shortcut ⌘'. If you wish, you can change your grid settings by going to View ▸ Grid Settings. The grid helps line things up horizontally or vertically. The horizon will be used as a horizontal reference. Now, rotate the image so that the hillside is lined up with the horizontal lines on the grid. Choose Layer ▸ Rotate and Transform ▸ Scale and Rotate (⌘⇧T) from the menu. Points will appear at all corners of your image. When you move your cursor past the corners, it will change to the rotate cursor as shown below. Rotate your image until your vertical or horizontal reference is lined up with the grid. Double click to commit your rotation, or click the ‘Apply’ button in the palette. The image needs to be cropped to remove the transparent areas. Select the crop tool from the tools palette. You can read more about how to crop here. The result is a nice straight image.